Our free check will tell you immediately whether you are entitled to compensation. Simply type in your flight - whether there was a delay, cancellation, rebooking or a missed connection. Flights can be claimable for up to six years! With your authorization, our highly experienced team of travel law experts will enforce your case against the airline to help you get your money. If necessary, we defend your claim in court. We will keep you informed about the progress every step of the way. Your money is here! We will immediately transfer the compensation to you and deduct a success fee of 25% + VAT. Should we not be successful, there are no costs for you. You only pay us in case of success. We then receive 25% of the enforced compensation plus VAT. Should we be unsuccessful, you don't pay anything. That's fair, isn't it? Even our initial assessment of your problem flight is free. 7 out of 10 customers report that the airline doesn't pay their compensation or doesn't even reply. Because of that many passengers feel left alone. Our legal experts fight for air passengers' rights and enforce their claims against all odds. We know the airlines' excuses, fight our way through the paper-warfare and go to court for your right. The No. 1 in Europe: We have already enforced over € 200,000,000 for our customers. "With extensive experience in European flight delay compensation laws, Flightright handles all your paperwork and legal interactions with the airline, and assumes 100 percent of the risk while pursuing your claim"
"Flightright suggested that 397,000 UK passengers affected by summer disruption were entitled to more than £128 million in compensation"
"At Flightright you get your compensation with only one click"
When you are finally ready to embark on that long-awaited holiday or are heading home after a city break, you usually trust that the flight you booked will take-off on time. 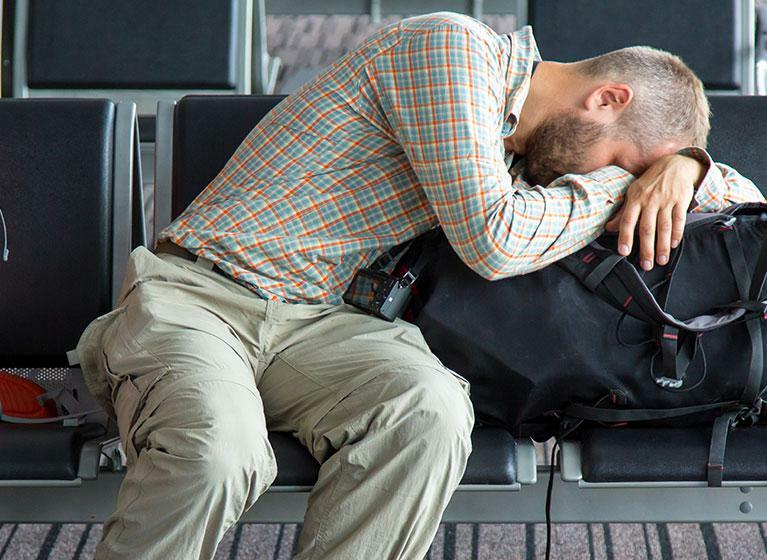 Unfortunately, there are a variety of circumstances which can lead to flight delays, cancellations or missed connections. When these situations arise, passengers have extensive rights as laid down in the EU regulation 261/2004 – compensation after flight disruption is at least some consolation. A delay means you arrived more than three hours late at your destination. If the reason for the delay was as a result of the airline's inability to fly due to conditions under its control, you may be entitled to compensation of up to €600 or full refund if you're delayed more than five hours, regardless of cause. When you claim for compensation after flight disruption, problems often arise as airlines are reluctant to pay voluntarily. Claims are regularly rejected with reference to "extraordinary circumstances", even though the airline in question was actually responsible. This is where Flightright comes into play: we represent your air passenger rights, claim your right to compensation and, if need be, we'll take proceedings to court. You will never bear a cost risk. Our expertise enables us to argue more professionally than individual consumers. Using Flightright flight delay checker saves you unnecessary paperwork and stress. Our experienced travel law experts make sure that you get what you are entitled to. You only pay us in case of success - we assume the cost risk. In order to successfully claim compensation, in case of a flight delay or cancellation, certain conditions need to be fulfilled: the flight needs to start or land in an EU member country. In the case where the flight lands within the EU, the airline executing the flight must reside within the EU. As such inbound flights from outside the European Union may also be claimable. If you, as a passenger, have a valid reservation and you checked in on time, you are generally on the safe side. If an airport or air space is closed and delays occur, you can receive a ticket refund, but not usually compensation. A cancellation due to technical problems, on the other hand, is a different story: the airline has to prove that they are not responsible for this fault. Otherwise, compensation of between €125 and €600 is due. Additionally, the airline may have to offer other services such as phone calls or meals for example.